A day after the big blizzard in February, I did the sensible thing and flew to Miami. It was a pre-planned trip to visit my parents in Key Largo. There would be some golf, a Super Bowl party and, of course, plenty of amazing birds. Golf is really just another birding opportunity, especially in Florida. My binoculars were always within reach. At one point I was walking down a fairway with a magnificent frigatebird soaring directly above me, mockingbirds singing from the gumbo limbo trees and a flock of white ibis pecking away in the rough. These were most welcome distractions! On Super Sunday mom and I took a drive to Everglades National Park. I’d been there at least five times before but it never gets old. And this time I saw something new—nesting American anhingas. A thriving rookery was eye-level and only a few feet off the Anhinga Trail boardwalk at Royal Palm. Alligators lurked in the dark water below the nests. I wondered if the anhinga chicks, some of them with featherless pink heads, perceived the danger just below them. I’m sure the adults did. 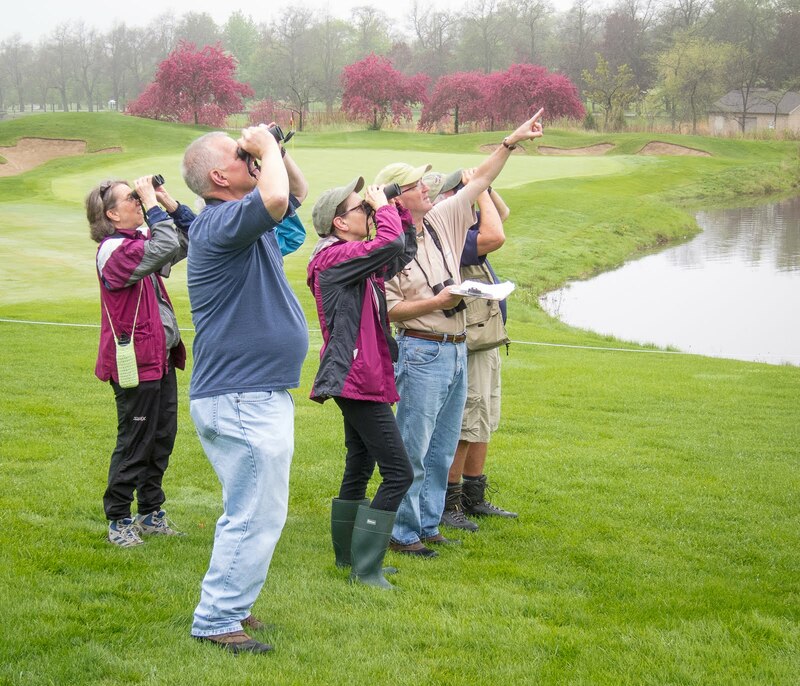 Just outside the park is an unmarked woodlot known to birders as Lucky Hammock—a local hotspot akin to the Magic Hedge on the Chicago lakefront. Some photographers with very large lenses were on site when we arrived. Either there’d been a Bigfoot sighting or an interesting bird was present. It was the latter, in the form of a brown-crested flycatcher—a western species that occasionally winters in South Florida. I’d have loved to see the bird but had to settle for just hearing it call from deep inside the hammock. The best birding, I knew, was yet to come. I’d built in some time at the end of my trip for a visit to central Florida. I’d been to this region twice before on family vacations to Disney World. This time I’d have an afternoon to explore a different magic kingdom: Merritt Island National Wildlife Refuge. Adjacent to the Kennedy Space Center, about 40 miles east of Orlando, Merritt Island is Florida’s top birding destination. It didn’t take long to see why. 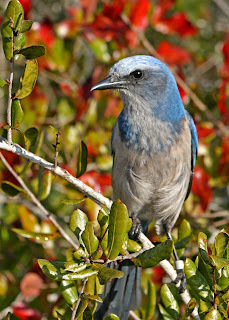 My top priority was to locate the preserve’s signature bird, the Florida scrub-jay. This is Florida’s only endemic species—a bird that occurs nowhere else in the world. It is endangered, but fortunately not difficult to observe; like other members of the jay family, it’s not shy. A ranger at the Merritt Island visitor center told me exactly where to go look and within 30 minutes I had my lifer scrub-jay. Yes! Another must-see at Merritt is Black Point Wildlife Drive, a seven-mile self-guided auto tour through salt and freshwater marshes. Birders (and nature photographers) could easily spend an entire day here. My time was limited so I really had to push myself to keep from stopping at every available parking area. There was one large pond in particular that was absolutely loaded with waterfowl and wading birds. Highlights were reddish egret, American avocet and a nice assortment of ducks including many northern pintail. The skies were full too, with bald eagles, ospreys, herons and vultures. Another great Merritt moment awaited near the end of Wildlife Drive where a cluster of glossy ibis feeding in shallow water. The late afternoon sun was showing off their iridescent plumage to perfection. It was painful pointing my car away from Merritt Island but I needed to be in Orlando for a work-related event that evening. The consolation was that I’d have time for more birding the next morning before heading to the airport. The Orlando area offers many fine birding opportunities. I settled on the Disney Wilderness Preserve, a 12,000-acre property near Kissimmee owned and managed by The Nature Conservancy. It opened in 1992 through an agreement with Walt Disney Company. The morning of my visit was quiet—I never saw another person on the trail! But I did see lots of birds. My favorite sighting was a family of limpkin, on the edge of the preserve’s Lake Russell. I’d never seen this Florida specialty quite so well, and in such a wild setting. Other interesting birds were loggerhead shrike, tufted titmouse, wood stork and sandhill crane. With more luck I might have seen my first red-cockaded woodpecker. The Nature Conservancy successfully introduced this highly endangered species at the Disney preserve four years ago. Another hoped-for species was Bachman’s sparrow, and my desire to see it probably cost me a life bird. I’m a little embarrassed to even tell this story but here goes. I was nearing the end of the walk, coping with an annoying drizzle, when I encountered a mystery bird. It was a sparrow of some kind, perched near the trail and looking very soggy. I studied it for several minutes, trying to memorize its features and markings. Could this be a Bachman’s? I’d check my Sibley guide when I got back to the car. The bird finally flew off and I headed in. I soon realized the bird was not a Bachman’s sparrow but was almost certainly a vesper sparrow—another species missing from my life list. If only I had watched more carefully when the bird flew! Then I might have seen the white outer tail feathers that are conspicuous on a vesper. The other mistake I made was not spending a few minutes perusing the preserve’s bird checklist before hitting the trail. If I’d done so I would have known that vesper sparrows are winter residents on the preserve. A valuable clue had been right in my pocket! Despite flunking the vesper sparrow challenge I left the Disney Wilderness Preserve in high spirits. It was a fun morning at a wonderful birding spot. It’s also the kind of place that feels good to support, especially if you are a fan of The Nature Conservancy like me. Go there if you ever have the chance. Now it was time to head back to the frozen north. But before surrendering the rental car I needed to satisfy a craving. One exit before Orlando International, there it was, a Waffle House beckoning me to a seat at the counter. My pecan waffle was a sweet ending to a warm and bird-filled week.